One of the many problems I see budding chefs, or home cooks have while cooking is how to thicken sauces, soups, stews, and other liquids. A basic, yet essential skill to have as a cook, knowing which ingredients to use to produce a thick, creamy consistency can be confusing. In the following guide, I’ll cover which ingredients can be used to thicken various dishes, when to use them, and how! There are so many ingredients and methods available to a cook in order to thicken liquids, that it can be difficult to list them all. If you have a favorite ingredient/method you use that’s not listed below, please let me know in the comments and I’ll add it to the list! Why Do You Need To Use Thickeners? Let’s start with the very basics first. Why thicken sauces, soups, stews, and desserts at all? The simple answer is mouth-feel, or texture! Texture is just as an important part of eating food as flavor is. We expect certain foods to have a certain texture or mouth feel to them, and it can influence if we perceive a dish to be “good” or “bad”. Texture also adds variety to dishes, and subconsciously makes the food we eat more interesting and fun to eat. Some recipes simply HAVE to be thickened in order to work out. A fruit pie is a good example. If the filling is not thickened prior to baking, you end up with a beautifully crisp crust filled with liquid. Not something that is easy to eat, or enjoyable for that matter. 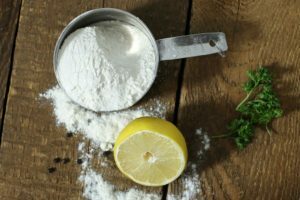 So What Ingredients Can I Use As Thickeners? This is where things become a little complicated. There are many items that posses thickening properties, but not all are suitable for every recipe. We’ll start with the traditional, and more commonly used items, and make our way to more modern techniques. Starches are most often sold in a powder form, such as flour, corn starch, or potato starch. They usually need to be mixed into another ingredient such as cold water, or a fat to prevent them from clumping in the hot liquid they are added to. Veloute sauce is thickened with a starch, as is bechamel sauce. All starches can be made into a slurry before using them to thicken liquids. This means mixing the starch with some cold water and dissolving it before adding it to the liquid to be thickened. Once a slurry is made, the starch is added to the hot liquid, and gently cooked to activate the thickening properties. As the liquid is cooked with the slurry, the starch swells and forms a gel that binds and thickens the food. Whenever you use a starch to thicken a liquid, it is important to bring the liquid to a boil after adding the starch slurry to the mix. This allows it’s thickening properties to properly do their job. Some starches such as flour, need to be cooked for longer periods of time, (up to 30 minutes), to ‘cook out’ the starchy flour flavor and fully activate it’s thickening power. Roux is the traditional French way of thickening sauces, and some soups. Essentially a roux is a mixture of equal parts flour, and butter by weight. It’s important to note that a roux is always weighed out, and never measured. This is because 1 cup of flour, and 1 cup of butter, are not actually equal when weighed out. A good rough should be stiff, and not runny. To make a roux, the butter is first melted, at which point the flour is added to it. The roux is then cooked further to produce either a white roux, blonde roux, or brown roux. Keep in mind that the longer a roux is cooked (ie: a brown roux) the more it will loose it’s thickening power. The starch content of different flours can also impact how strong your roux is. Bread flour for example is high in protein and low in starch, making it a poor choice for use in a roux. Cake or All purpose flour are both fairly high in starch and make an excellent roux. How Much Roux Do You Need To Thicken A Liquid? At minimum you need 100 grams of roux to thicken 1 liter of liquid. To create a thicker consistency, you can increase the amount of roux to 150 grams or 200 grams per liter. Very similar to a roux, beurre manie uses flour and room temperature butter to create a thickening agent. 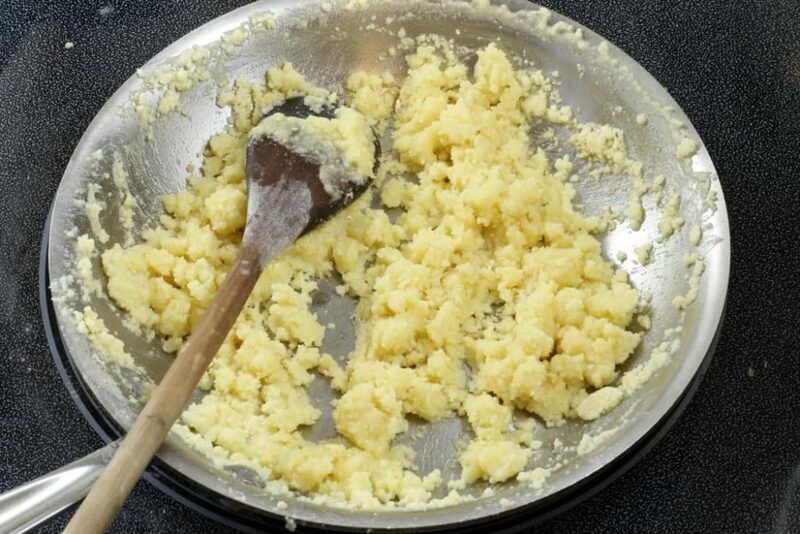 Where a roux is measured in equal parts flour and butter by weight, beurre manie is measured by volume. To make a beurre manie, measure out 1/2 cup of flour and 1/2 cup of softened butter. 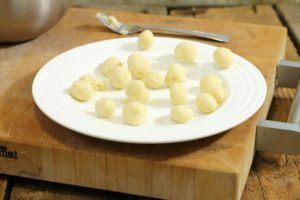 The flour and butter are then kneaded together and then formed into little balls. 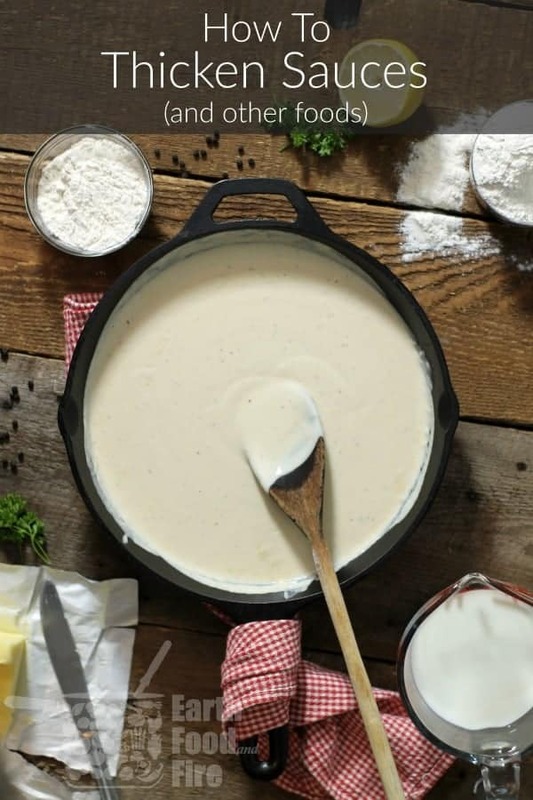 A beurre manie is traditionally used to thicken soups and sauces at the end of the cooking process, or to quickly adjust the consistency right before serving. It will add a light shine to sauces as it melts, making it great for thickening espagnole sauce and other gravies right before serving. A traditional method of thickening liquids that does not use a starch are eggs. Eggs thicken foods by coagulating, and care must be taken not to heat them to quickly to prevent the eggs from curdling. Desserts such as custards, cream sauces, creme brulees, and ice cream all use tempered eggs as a thickener. Savory dishes such as sauces and soups, can be thickened by using a liaison. While a liaison does slightly thicken, it mainly adds richness, and smoothness to soups and sauces. The most common method of using eggs to thicken foods, (especially desserts) is by tempering them, although some recipes such as pumpkin pie use whole eggs as a thickener as the product is cooked or baked. Tempering refers to the action of slowly adding a hot liquid to eggs to raise their temperature without curdling them. This can be done with liquids such as an Alfredo or other cream based sauce, or with a creme brulee or ice cream base. Start by whisking the eggs in a bowl. Bit by bit add the hot liquid (ie: your sauce or ice cream base) to the eggs while whisking them to gradually raise the temperature of the eggs. Once the liquid egg mix is hot, it can be whisked into the liquid to be thickened. A liaison is almost identical to using tempered eggs, but with the addition of heavy cream. A liaison is used to thicken savory soups and sauces while adding a smooth and rich texture to the end product. A liaison actually uses the tempering method describes above to heat the eggs before the egg and cream mixture is added to the hot soup or sauce. By adding cream to the eggs before tempering, you raise the temperature the eggs coagulate at, reducing the chance of curdling the eggs. To thicken 1 liter of liquid you need 2 egg yolks and 2 fl. oz (60 ml) of cream. Whisk together 2 egg yolks and 60 ml (or 4 fl. oz.) of heavy cream. Milk can also be used but cream will add a richer texture. Gradually temper in the hot liquid to be thickened, and temper the egg mixture as described above. There are many modern refined ingredients that can be used to thicken foods as well, and many of them are used commercially in sauces, jams, and dressings, because they are very stable, have a long shelf life, and don’t add any color or flavor to the finished product. A naturally occurring fiber found in most plant cells, pectin is produced on a commercial scale for use in thickening foods, medications, and sweets. Most commonly associated with use in jam making, pectin helps gel jams, marmalade, and jellies, which would otherwise have a sauce like consistency. Pectin is water soluble and binds with sugar, and fruit acids to create the gel like texture of jam we all know. You can make your own pectin if you like using apple scraps, but it can also be purchased in a powdered form, and may be easier to use in recipes. Agar Agar is made from a various types of red seaweeds, and is popularly used in Asian cuisine to thicken desserts, sauces, and preserves. It is similar to gelatin, and is often used as a vegetarian alternative, though it gives a much firmer texture then gelatin once set. To use Agar Agar dissolve the agar powder or agar flakes in warm water and then mix it into whatever you are thickening. Bring it to a boil before chilling to allow it to set. Xantham gum is a polysaccharide made by fermenting sugar with a specific bacteria (from which it gets its name). It is most often sold in powder form, and is very commonly used in the commercial food industry to thicken any liquid food. It also acts as a preservative making it a popular food additive. To use xantham gum, dissolve the xantham powder in water (in a 2:1 rato) and then stir the liquid into you soup, sauce or other food. The xantham gum will create a gel like texture. Also called guaran, guar gum is extracted from guar beans and has stabilizing and thickening properties. Just like xantham gum, guar gum is gluten free, making it a popular choice as a thickening agent in gluten free recipes. It is used commercially to thicken dairy products such as, milk, yogurt, and ice cream. Guar gum is used to substitute wheat flours in baked goods due to it’s gluten free nature. Guar gum is most often sold in powder form, and is used much like xantham gum. To thicken dressings, smoothies, or other liquids, simply dissolve a pinch of the guar gum in water and then add it to your recipe. Start with just a pinch, because a small amount of guar gum can thicken quite quickly. Guar gum is unique in that it does not need heat to thicken, and will gel on its own after being dissolved in liquid. This makes it great for stabilizing and thickening salad dressings, ice creams, jello etc. Just as pectin is naturally occurring in plant cells. Gelatin, is naturally found in collagen (the connective tissues of animals), and is easily extracted through boiling. This is easily demonstrated when making chicken or beef stock at home. Once cooled the stock gels due to the high gelatin content. Commercially, gelatin is most often used to thicken desserts (such as panna cotta) and various sweets such as gummy bears, and other fruit snacks. It is also used in dairy products such as yogurt and various cheeses. Most often gelatin can be purchased as sheet gelatin or powdered gelatin. Sheet gelatin needs to be soaked in cold water for 5 to 10 minutes, after which it is gently wrung out, and then added to various recipes as needed. Powdered gelatin is sprinkled into cold water, and also left to sit for 5 to 10 minutes, after which time it creates a spongy texture. The ‘bloomed’ gelatin powder is then poured into warm or hot liquid to fully dissolve. Besides using various ingredients to thicken sauces, you can also opt for the oldest trick in the book. Reduction refers to the process of slowly simmering or boiling a sauce, soup, or other liquid in order to thicken and intensify the flavor by reducing its water content. While it is the most time consuming method of thickening foods, reducing has the benefit of not requiring any extra ingredients, as well as automatically intensifying naturally present flavors. Care needs to be taken when reducing dairy based liquids, since heating them to high can result in the liquid splitting, and the fat separating. If you’ve made it this far, you can tell that thickening sauces and other foods can be quite a complex task with varying methods and ingredients available to the home cook. Did this guide to thickening sauce and other foods help you out? Comment & Rate the guide below, then take a picture and tag me on Facebook & Instagram: @earthfoodandfire . For more from scratch recipes follow me on Instagram & Pinterest! This is an excellent tutorial on thickeners, Markus! I will share and pin for future reference. Thank you so much for sharing your expertise. This is so detailed and helpful! I’m definitely bookmarking for future reference. I usually just go with a starch as a thickening agent, so I appreciate the number of options you’ve included here. Thanks for sharing Markus! Thank you for this thorough explanation of thickeners. Much of it can be applied to gluten-free cooking, so it’s a valuable resource for us. This is such a fantastic post! I love a nice, thick sauce, particularly this time of year when things are cold and dark. There’s just something so comforting about food topped with a thick gravy. I’ve always gone with a roux, simply because that’s what I know how to make, but I can’t wait to give these other thickeners a try! These are such great tips on using thickeners! I was just working on a recipe that mixes sour cream and salsa verde together and poured over chicken then baked. I couldn’t figure out to keep the sauce from breaking. Do you have any suggestions? Thanks! This is such a great article. I can’t tell you how many times I made something and it didn’t get as thick as I expected and not know how to fix it. Thank you for this breakdown. This is such a fun post for people that are new to cooking or those that are looking for other starches. Last week I used corn flour to thicken chicken tortilla soup for the first time and I’m so glad I did. The beauty of using different starches as that they can add a lot of flavors. I’m going to work my way through this list. Thank you so much for sharing. Very informative and detailed post. Bookmarked! Thank you for all of these helpful tips! I usually use flour or arrowroot to thicken sauces but love the idea of using oats. That’s a wonderfully comprehensive post that I saved for future reference. Great tips, your explanations are clear and helpful. Thank you! Glad to here it Nicoletta! Are there any traditional Italian thickeners or methods I didn’t list here? Woah, I love this! I actually started to use oats as a thickener for soups and stews. For custards, I’m more of an egg yolk girl! I will bookmark this one and reference more often in the future! A much-needed tutorial! Thanks so much for sharing. So many will find it helpful, I’m sure! 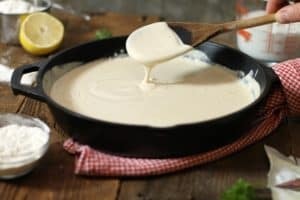 Loved reading your detailed post about thickening sauces. I usually use the gluten options. Nice to have some gluten-free options as well. It seems everyone defaults to using flour, but there are so many different options out there! This is very informative and helpful. Thanks for sharing! Your step by step simple way of explaining makes it more delectable. I hope the step-by-step instructions help! Wow, great post some very helpful tips here that i definitely need to try! Thanks! Glad you liked the post Nathan! I hope it helps. These are such great tips for anyone who spends time in the kitchen! I will refer back to this often! I frequently use roux, beurre manie, slurries and egg yolks to thicken sauces. I also have arrowroot and Instant ClearJel (King Arthur Flour) in my pantry, but i’ve never seen xanthan gum, guar gum or agar agar for sale in retail outlets. Would love to experiement with them. Do you have a preference? I have never used Clearjel is it like cornstarch? In regards to the other thickeners, I would suggest starting with xantham gum, as it’s the easiest to use. You can get some through amazon if you can’t find any in store locally.